Text by Jesús Hernández. 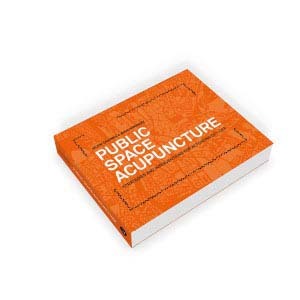 Published in "Public Space Acupuncture", 2015. Principal Designers: Grávalos & Di Monte Architects: Ignacio Grávalos, Patrizia Di Monte. Promoters: Zaragoza Vivienda (Municipal Housing Society of Zaragoza). Photographer: Grávalos & Di Monte Architects. Location: Different locations in Zaragoza, Spain. 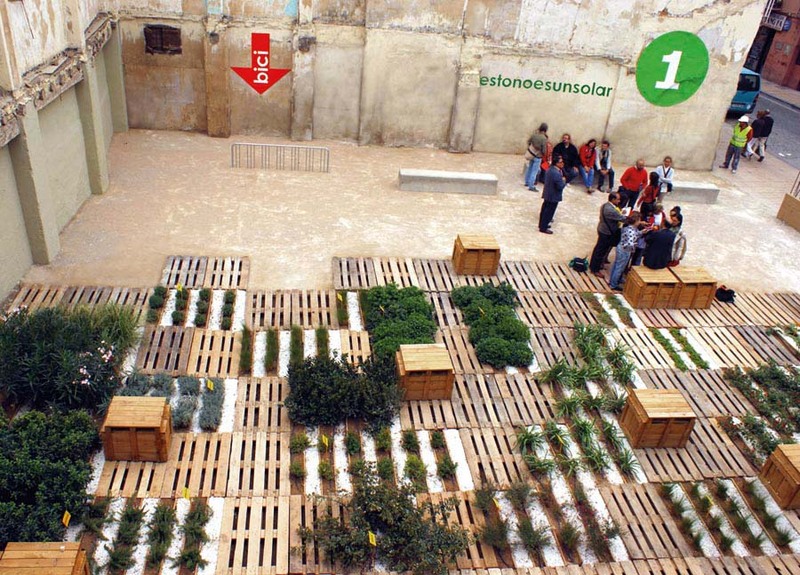 Long-term strategies based on temporary interventions sample in Saragossa by Ignacio Grávalos and Patrizia di Monte, Estonoesunsolar and Zaragoza Vivienda, Spain. The urban deterioration in certain areas of Saragossa’s historic center can be seen in the emergence of a large number of visibly abandoned vacant lots. In parallel to this urban decline, a growing number of immigrants have been moving into disadvantaged areas of the city, coinciding with locals moving out into new residential neighborhoods in the suburbs. These rapid social changes have generated profound transformations in the demographic structure of the historic city center, resulting in the increase of the number of immigrant families and children in the area. Finally, the irruption of the financial crisis in Spain led to an increase in unemployment, which has initially impacted more intensely on the immigrant population living in these areas. All these factors have contributed to an unusual situation brought on by a spiral of events which have caused urban decline and have the potential to create serious social problems in the future, as has been the case in the historic centers of other European cities. Given this situation, the Saragossa City Council developed a strategy called “Estonoesunsolar” (“This is not a vacant lot”), coordinated by Grávalos & di Monte. A technical office was created to provide rapid and effective responses to some of the urban problems mentioned above. The technical office, which depends on the municipal entity Zaragoza Vivienda, combined an employment plan for jobless people in the area with a plan for cleaning up the empty plots of land that was later transformed into a strategy for enabling public use of those abandoned lots. In this way, the walls and fences around numerous public and private abandoned lots in Saragossa’s dense historic center were torn down. The lots were cleaned up and many were transformed into small public squares, children’s playgrounds and community gardens integrated into the city’s network of urban public spaces. The time factor played a crucial role in the strategy’s development and the quick reaction time combined with the technical office’s operational autonomy were some of the keys to its success. The office was run on a limited budget, most of which was used to pay the salaries of people participating in the employment plan. The remaining money was spent on the materials used in the interventions. In the first year, the office carried out 14 interventions in public space and in the second year, 15. In this way, the process of obtaining the lot owners’ permission for each intervention, choosing a specific use for the lot based on citizen participation, designing each intervention and its subsequent construction all took place within an average period of four weeks per intervention. At the same time, the technical office’s ability to react quickly in managing and maintaining the completed interventions was essential to guaranteeing the strategy’s success and, when necessary, the least successful interventions were modified, serving as a learning experience toward improving future interventions. The fact that the strategy “This is not a vacant lot” operates on land that will eventually house construction, implies that it can only be based on temporary interventions. Although each intervention will remain in place for a shorter or longer period depending on the lot’s availability, the overall strategy has been planned as a long-term strategy that includes the possibility of acquiring a permanent character. Permanency could be achieved by generating a cycle in which, at the same time that temporary interventions are dismantled to build on some lots, new temporary interventions are installed on other abandoned lots so that the number of interventions in use is maintained more or less constant. In this way, “This is not a vacant lot” establishes a long-term public space acupuncture strategy based on temporary interventions. Most of the interventions in the program “This is not a vacant lot” are located in the historic center of Saragossa, which includes the former Roman city of Caesaraugusta, founded in 12 B.C., and its subsequent extension until the 19th century. Only a few of the recent interventions are located in new areas of the city developed during the 20th century. The historic center of Saragossa presents a mix of hybrid residential buildings with commercial spaces on the street level, combined with some working activities. Users of public space in the intervention areas are mostly residents of nearby neighborhoods, eventually mixed with visitors from other parts of the city and office workers. The growing population of elderly people living in Saragossa’s historic city center has recently been compensated by a growing number of young immigrants. In the study area, immigrants represent 25.5% of the population, whereas the average percentage of immigrants in Saragossa as a whole is just 15.6%. The concentration of immigrant population has led to an increase in young people and families living in the area, but it has also raised the unemployment rate in the neighborhood, 14% in 2011, which is higher than the city’s average. The strategy is composed of dozens of interventions, many of them concentrated in the city center, though some have also been built near the river and in other neighborhoods. Five interventions have been selected to be studied in detail: two are located in San Pablo neighborhood, in the west of the old city center; two are located in La Magdalena neighborhood, in the east; and one is in Las Fuentes neighborhood. The empty lot, which is limited by the walls of nearby buildings along three sides and opens toward the street on just one side, was opened to the public in 2009. The space was designed as a thematic garden divided into 4 areas: shrubs, aromatic plants, creepers, and flowers and it is linked to schools and education centers for the promotion of educational and recreational activities. Some benches and an informal bicycle parking area are located in front of the garden. 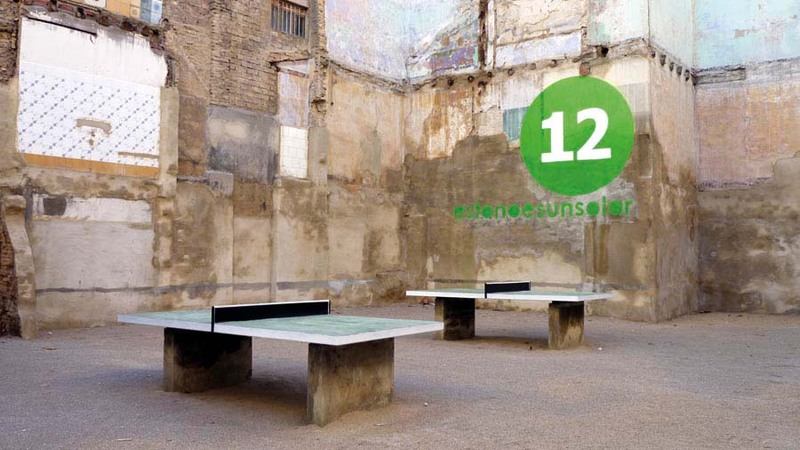 The name “Estonoesunsolar”, together with the digit “1” printed in green on one wall of the site, brand the strategy and designate the first intervention in the series. This intervention, located near “San Blas 94”, was developed in collaboration with Santo Domingo public school and the children’s association Cadeneta in order to transform the lot into an urban garden for recreational and educational purposes. Two containers, painted in the characteristic green color used for branding the entire strategy, serve as storage space and house a winter garden where small plants are grown. The lot is fenced and is used exclusively by people in the neighborhood and the owners of the gardens. This intervention was designed in collaboration with the children from Gusantina primary school, located in the neighborhood. A design atelier and a competition for children between the ages of 5 and 12 resulted in the selection of a winning design, which was subsequently implemented on the site. 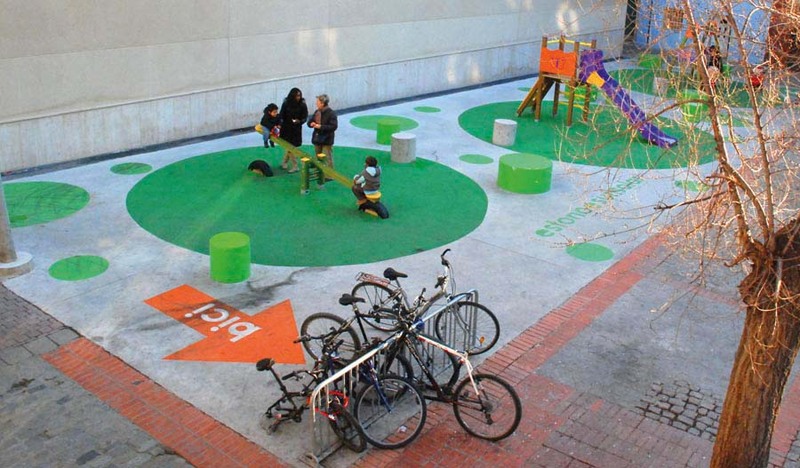 The involvement of children and parents in the programming and design of the public space was intended to inspire civic pride and raise awareness among neighbors about the urban environment, thus promoting a feeling of belonging. Benches, streetlights and a podium are combined with murals along the lot walls, painted by well-known street artists. The pavement on the site was painted in many colors to depict typical children’s games, word searches and a small-scale race course. 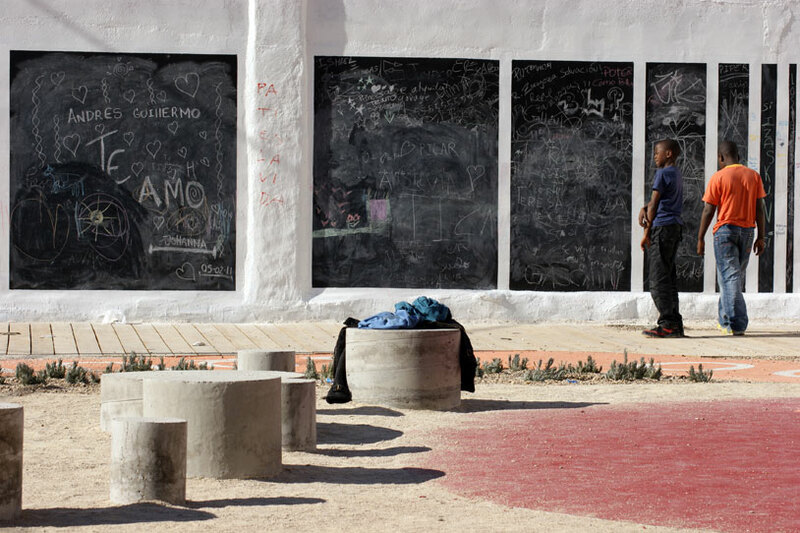 The colorful paintings contrast with the neutral color of the concrete and the whole intervention relies on the use of something immaterial such as paint to transform the lot into a playground. The use of elements that are also present in other interventions, such as the bike racks, the program logo, and a big “5” painted on the wall representing the intervention’s number indicate that this intervention is part of a general strategy. The intervention combines a children’s playground with facilities for people affected by Alzheimer’s disease. Children learning new words come together with adults, many of an advanced age, who need to exercise their memories every day to keep from forgetting the words they already know. Patrizia Di Monte collaborated with a nearby association that takes care of people affected by Alzheimer’s disease in order to create a design that integrates special signs to help patients exercise their memories as they walk along the paths through the intervention. A number of tables, sitting areas and prints on the old walls refer to the residential functions that the place once had and lend the intervention a certain domestic character. Zaragoza Vivienda, an organism that depends on the municipality of Saragossa, initiated the strategy in 2009. In 2010, it created the special office called “This is not a vacant lot”, the main actor responsible for developing the strategy and dealing with the realization, management and maintenance of all the interventions. The strategy’s initial goal was to combine an employment plan, providing work for long-term unemployed people, with a rehabilitation plan intended to clean up the many vacant lots in Saragossa’s city center in order to improve its physical condition. Based on her previous urban studies focused on vacant lots in Saragossa, Patrizia Di Monte, the architect in charge of the “This is not a vacant lot” technical office, proposed demolishing the fences and walls that isolated those lots from public space. By doing this, the empty lots were integrated into the urban network of the city’s public space for as long as they remained unbuilt. The technical office team consists of an architect, who is in charge of the coordination and design of the interventions, a technical architect in charge of the construction, and a manager in charge of controlling the costs. The realization of the interventions was carried out with a group of 40 people participating in the reintegration and unemployment plan. They learned the necessary techniques for building the interventions, assisted by the technical architect. Citizen participation is widely integrated into the strategy in order to involve local residents in the decision-making process and the design of each intervention. Participation is organized through a series of meetings between the technical office architect and the main local actors: the councils of the affected districts, neighborhood associations, public schools, children’s organizations and senior citizens’ centers. During those meetings, the neighborhood’s needs are discussed and a program is determined. The neighborhood’s urban planning commission is also invited to supervise the program and design of the plot, in accordance with city regulations. Other types of citizen participation have been tested during the strategy. In one of the interventions, the final design was the result of a design competition organized with the participation of children from a nearby school. The children were involved in a workshop, together with their teachers and the technical office architect. The winning design was then developed and carried out by the technical office. The children’s participation in the design phase of the intervention played an educational role, but it was also intended to engage parents and residents in the project. It reinforced the relationship between citizens and public space, which translated into increased respect for urban elements, thus reducing vandalism and the need for maintenance. The available budget for the development of the strategy “This is not a vacant lot” and the construction of the interventions from July to December 2009 was €1 million. Using this budget, 14 vacant lots were opened to the public and transformed into public spaces (12 private vacant lots and 2 public ones). In addition, 44 vacant lots were cleaned and painted fulfilling the program’s original objective. This urban renewal encompassed a total surface area of 9,800 m2. The €1 million budget was used to pay 40 people’s salaries and to cover the expenses for the materials used in the interventions, at a cost of €200,000. Between June and December 2010, 3 times more public space was transformed than in 2009, reaching a total of 32,000 m2, distributed among 15 empty plots, all of which were publicly owned. The total budget for 2010 was €1.2 million, which was used to pay salaries to 61 people and to cover the costs of the material used to realize the interventions. The low budget made it difficult to use standard urban furniture elements and made it necessary to develop a specific and creative design solution for each intervention. Only the children’s playground equipment was purchased separately. The rest of the elements were all built by the working team. The technical office and the working team were responsible for the management, construction, maintenance and demolition of all the interventions, in keeping with a fixed budget, and working independently from the other municipality services. 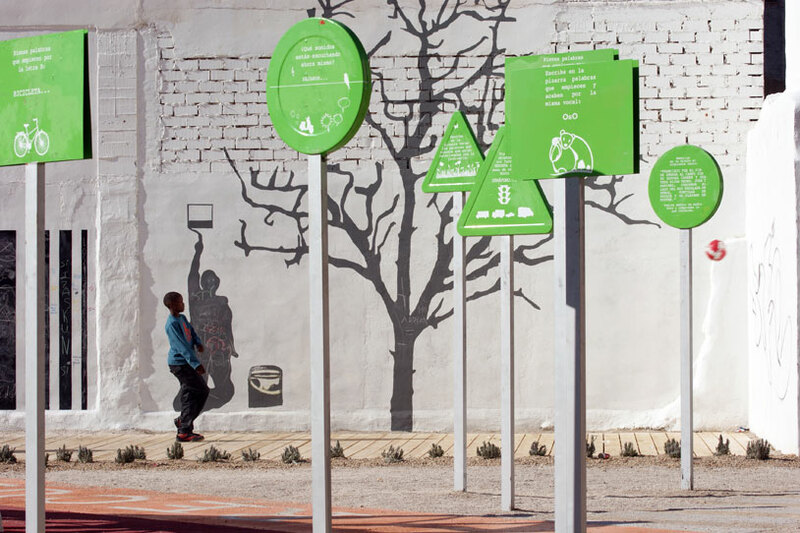 The interventions enjoy a special status in comparison with the rest of the city’s public space. Although they can be considered part of the public domain, many of them are not built on public land, but rather on private property. At any time, the lot owner has the right to build and the technical office is responsible for dismantling the intervention with the help of the working team contracted by Zaragoza Vivienda. The strategy is based on the temporary activation of inactive parts of the city. In periods of economic crisis, the time span during which empty plots remain inactive is extended. Flexible strategies based on the temporary occupation of empty lots create a rapid positive effect in dense urban environments. However, at the same time they require a flexible management structure that is capable of reacting quickly. 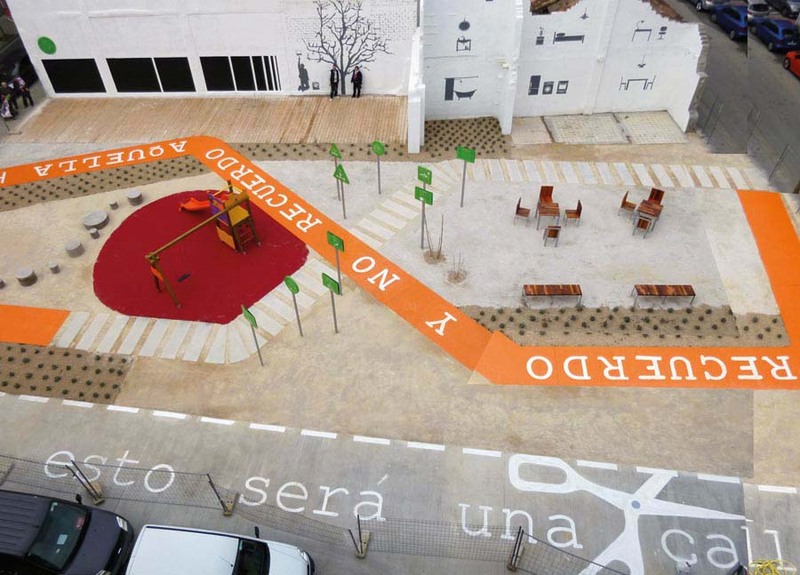 In 2009, the technical office of “This is not a vacant lot” had the priority to develop the vacant lots located in Saragossa’s historic center, following a pedestrian route that was designed to link them. Even though most of the lots were privately owned, the strategy was very successful and the number of realized interventions grew at a frenetic pace. In 2010, the project was already very popular and it was extended to other areas of the city. The interventions were carried out chronologically, based on the order in which requests from the city’s different district councils were received. The technical office also proposed a number of public plots to house interventions, which were interesting because of their strategic positions within Saragossa’s urban structure such as the river front, or others because they were important for reinforcing the network of interventions. The interventions’ lifespan is variable and depends on the availability of the lots. The long-term scenario foresees a stable strategy based on a variable number of interventions, which change location within the urban structure of the city depending on the gradual construction on empty lots and the creation of new ones. The strategy “This is not a vacant lot” has resulted in a general improvement in the use of public space in the city of Saragossa. First, because it created public areas in a dense urban city center and second, because these areas were successfully programmed with activities related to the needs of people who live in those neighborhoods. However, the overall positive influence of the strategy does not mean that all the interventions were entirely successful. Some of the interventions that experimented with publicly accessible urban gardens experienced maintenance problems and after one year of use they were in such a state of deterioration that they had to be transformed into interventions that were easier to maintain. On the contrary, some urban garden interventions where specific groups or institutions have been responsible for the maintenance are still in good state. The main criticism of the strategy by some residents has to do with the lack of use of few interventions and their quick deterioration. The temporary and innovative nature of the strategy promotes experimentation with a variety of programs and designs in the lots, in order to test their viability. If the test is successful, the program or design can be implemented in other lots. If not, the management team can quickly transform the intervention, having learned from the experience. Citizen response to the strategy was very positive. A large number of groups and neighborhood associations were very enthusiastic about the results. The strategy originated such high expectations among citizens that the technical office could not respond to the large number of demands for new interventions. “This is not a vacant lot” has also had a positive influence on citizens’ perception of their own city and the role of the public administration. The transformation of private and unused land into something public and useful bears a strong social message, especially in times of economic crisis. Part of the strategy’s success in terms of public opinion was based on breaking with conventional thinking as dictated by the bureaucratic institutional machinery. The fact that the public administration was involved in that kind of transformation, that they were capable of developing an administrative mechanism to make it possible, resulted in strong support from citizens and has opened the door to a new relationship among the city, its citizens and the municipal institutions. The mass media impact of “This is not a vacant lot” has been enormous. From the beginning of the project, local newspapers supported the strategy with front-page news stories and full-length articles. Later, the most important national newspapers, along with television and radio stations, also gave attention to the project. The first effect of this media attention was an increase in citizens’ interest in participating in the project. The second effect was that the municipality increased economic support for the project, programming more interventions and involving more people.